Juhu Beach Club chef Preeti Mistry’s second restaurant serves American fare infused with Indian flavors. 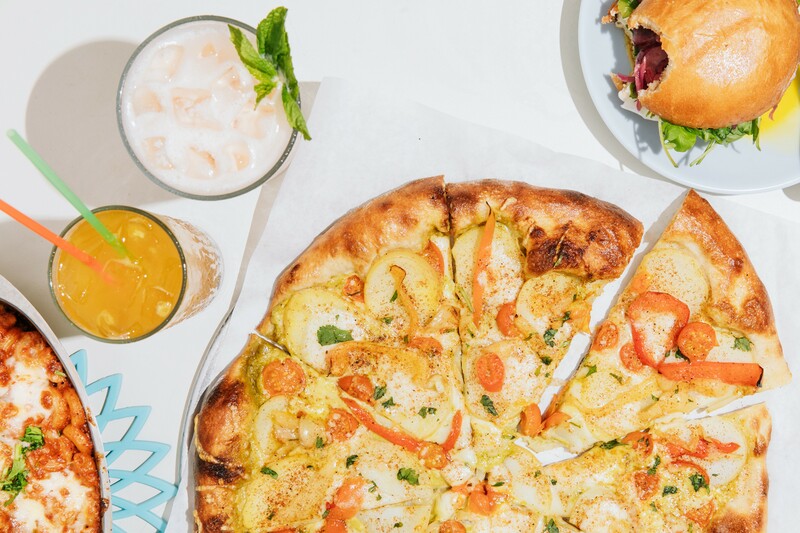 The Emeryville restaurant dishes out "vaguely Indian" pizzas, such as the Leelu Potato. Perhaps more than any other current chef in Oakland, Preeti Mistry has ascended to household-name status. Blame the media — the Express included. There was Mistry’s brief stint on Top Chef and, more recently, an endorsement from Anthony Bourdain on Parts Unknown. Her innovative, chef-driven Indian fare at Juhu Beach Club led to plugs in national magazines, including Food & Wine, Bon Appétit, and Sunset. And locally, every publication that covers food promoted Mistry’s highly anticipated second restaurant, Navi Kitchen, before it even opened its doors in April. Most wrote about it multiple times — again, the Express included. So, when I finally got around to visiting Navi Kitchen earlier this month, I was shocked to find the place completely empty. It was 6:30 p.m. on a Saturday, and no other parties arrived through closing time. It’s a very real possibility. Apart from Mistry herself, there’s a lot to hype about Navi Kitchen. Let’s start with the space, designed by co-owner — and Mistry’s wife — Ann Nadeau. It’s cute, warm, and lively, with teal walls, plants, and framed posters that read the likes of “Love is the center of resistance” and “Black lives matter.” On the bathroom, a sign states, “Your gender is beautiful.” It’s an intentionally, actively safe space. The slight bummer is that there are only nine bar stools inside. Most seats are out on the back patio, which is brightly lit during the day, stocked with heat lamps for chilly nights, and roomy enough for kids to run around freely. The pleasantness starts to feel a little strange once you realize that you’re essentially hanging out in the center of an upscale housing complex where a one-bedroom apartment rents for more than $2,200 per month. Building the buzz: Navi Kitchen falls in line with the recent rise in casual, counter-service joints opened by pedigreed chefs. It gets bonus points for offering all-day dining — another trend the food media love to call out. And Mistry implemented a 15 percent service fee on all bills. At a time when staff retention is difficult and the traditional tipping model seems problematic, this move is sure to be watched closely by the industry. And then there’s the food: classic American with bursts of Indian flavors. It’s a new and exciting concept, and with Mistry’s work at Juhu Beach Club, comes with high expectations. It’s tempting to compare Navi’s dishes with those at Juhu, but that’s not a fair or rewarding exercise. While Juhu thrives on intense spice levels and layered textures, Navi’s dishes are far more simple. The best ones comfort in their familiarity, with an extra jolt of something special — and, more often than not, cheese. Take the tikka masala mac ’n’ cheese, a brilliant fusion of flavors that really shouldn’t be all that surprising given the deliciousness of paneer tikka masala. Here, garam masala and other warm, sweet spices balanced wonderfully with tomato, gouda, and white cheddar. The side of ghost pepper chutney amped up the heat and made the whole dish sparkle. But most folks come to Navi to try the pizza. Indian restaurants have been doing pizza for years, but it’s usually a massive base of thick, puffy crust loaded with chicken tikka masala. Mistry shrinks the size down to 14 inches, which is ideal for two or three diners, and goes lighter on the toppings. Collaborating with Starter Bakery, she developed a dough that’s thinner, crispier, and unique in flavor. Malt is added to speed up the caramelization, and ghee is brushed on at the end. In a region overrun with pizza, I’m not aware of a crust that tastes quite like this one. The Croque Gadame stars bacon spiked with chai spices. There are four topping options, with two leaning more Indian in flavor and two that, in Mistry’s words, are “vaguely Indian.” In the latter category, the Leelu Potato consists of cherry tomatoes, a pistachio-herb pesto, and thin slices of potato in addition to the mozzarella-Parmesan blend that makes up every pizza. It was light and lovely, punctuated by blasts of garlic, but I didn’t get the Indian-ness I was hoping for. Apparently, the pesto is normally more heavy on fenugreek, but the farmer Mistry works with was having trouble growing enough to meet demand. She recently paired up with an additional farmer, so future pies should carry slightly more Indian flair. I also tried the Keema Kale, which sits on the more Indian end of the pizza flavor spectrum. Keema is a traditional mincemeat dish, sort of like an Indian sloppy joe filling. Made with ground lamb and beef, it formed the saucy base of the pie, with strips of kale and pickled red onion. It certainly tasted interesting, but not all the components meshed together — particularly the bitterness of the kale against the heaps of cumin. I’m not exaggerating on the amount of cumin. I wondered if it was actually a mistake, like the bland green goddess salad I received that same night. The dressing was so light I could barely detect it. Breakfast was more consistent, and Navi really feels alive in the mornings. Floor-to-ceiling windows drench the space in sunlight and make the marble countertop shine. The neighborhood drops in on its way to wherever, as it’s the only eatery — or business of any kind — for blocks. The two breakfast sandwiches feel reasonably priced and are tasty enough to give me a reason to return. I loved the Croque Gadame, which stars bacon sweetened with brown sugar and spiked with chai spices. 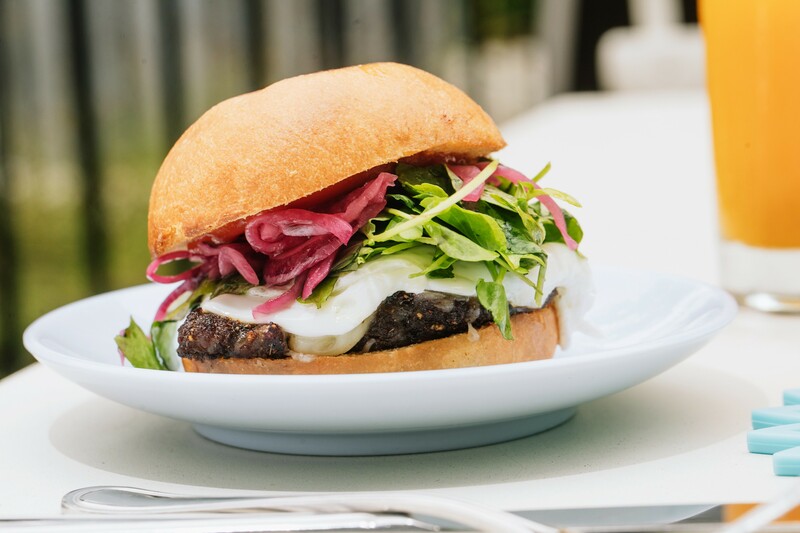 In supporting roles are white cheddar, a fried egg, pickled onions, watercress, and tamarind ketchup. All piled into a soft bun, the ingredients blend together in a sweet-salty harmony. Also good is the Mumbai Morning Burger, a tasty and fun spin on a classic sausage-egg-and-cheese breakfast sando, with a pork-ginger sausage patty flecked with herbs, melted American cheese, and ghost pepper chutney. Pair either with a perfectly creamy, spicy chai tea for an epic morning. Despite the somewhat slow start, Mistry said running Navi has been smooth and easy. A large part of that is due to the 15 percent service fee. She says there isn’t the usual tension between front and back of the house. Instead, everyone is happy earning a wage based on hours and responsibility level. It’s one way she and Nadeau work for the community: providing stable jobs in a supportive environment. Another way is by donating $1 from certain dishes to the nonprofits Black Lives Matter Bay Area, Destiny Arts Center, and Planting Justice. Social change, social justice, intentional community-building — these are all essential to understanding Mistry, Nadeau, and Navi Kitchen. The food itself isn’t always mind-blowing, but as a complete package, Navi deserves the attention.